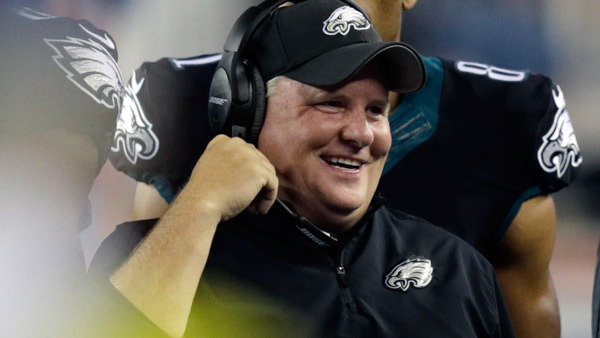 BRISTOL, Conn. -- Former Philadelphia Eagles coach Chip Kelly is joining ESPN as a studio analyst next season. ESPN announced Friday it has signed Kelly to a multiyear deal. Kelly will primarily be part of Saturday pregame, halftime and wrap-up shows on ESPN2. He'll also provide NFL analysis on Sundays during SportsCenter. The 53-year-old Kelly spent the last four seasons in the NFL, coaching the Eagles for three years and San Francisco for one. Kelly was fired by the 49ers after going 2-14 last season. He was 26-21 with a playoff appearance for the Eagles. Before jumping to the NFL, Kelly spent four seasons as Oregon head coach and went 46-7. In 2010, Kelly led the Ducks to the BCS title game and was The Associated Press coach of the year. "I spoke with a lot of people this offseason about different situations for me - in coaching and TV," Kelly said in a statement. "I had various opportunities in both. In the end, I have had a relationship with ESPN for many years from when I was coaching and after speaking with them, I decided it was the best step for me to take." Kelly figures to be in demand at the college level when head coaching jobs begin opening next season. Spending a season or two doing television has been a common path for coaches between jobs. Urban Meyer spent a season at ESPN between resigning from Florida and landing at Ohio State. So did Rich Rodriguez after being fired by Michigan and before being hired by Arizona. "I have been a coach for nearly the last 30 years," Kelly said. "Working in television will allow me to see the game from a different perspective, but I didn't take the job with the intention it will lead to something specific. I love the game of football and working with good, smart people; ESPN presents an opportunity to combine those two things." Kelly will fill an opening left by Butch Davis, who became head coach at Florida International. Kelly was considered one of the most innovative coaches in college football. His up-tempo spread offenses dominated defenses and were mimicked by teams all over the country. "As a coach, he saw the game from a unique perspective, never afraid to take an unconventional approach," said Lee Fitting, ESPN senior coordinating producer. "We want him to bring that mentality to our college football coverage each week, offering fans a varying viewpoint outside of the conventional thought process."